Allows for numerical time-evolution of single-particle wave functions in arbitrary (time-dependent or -independent) potentials. $\psi_0$: State - The initial state that will be evolved. H: Hamiltonian - The Hamiltonian that will be used to evolve the state. dt: Scalar - The time step size. $\psi_t$: State - The evolved state. This node is comparatively complicated. On each step it will take the state and numerically solve the Schröedinger-equation for the timestep, emitting the updated state. 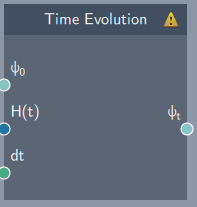 Note, that the Hamiltonian is allowed to be updated between steps, allowing evolution in time-dependent potentials. In the beginning (or when the reset-button is pressed), the state is set to the input-state.